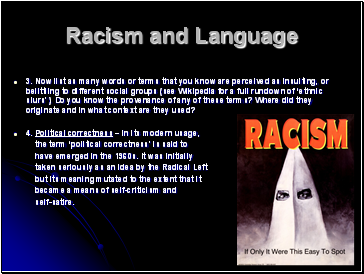 We often hear people complain about how ‘political correctness’ has ‘gotten out of hand.’ It is said by some that it is impossible to know what words are offensive and inoffensive to others. The implication is that society has become far too sensitive about identity. 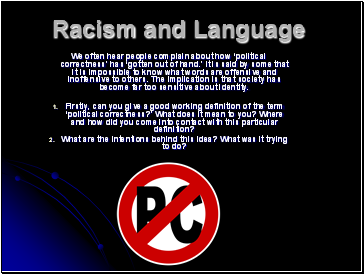 Firstly, can you give a good working definition of the term ‘political correctness?’ What does it mean to you? Where and how did you come into contact with this particular definition? What are the intentions behind this idea? What was it trying to do? 3. Now list as many words or terms that you know are perceived as insulting, or belittling to different social groups (see Wikipedia for a full rundown of ‘ethnic slurs’). Do you know the provenance of any of these terms? Where did they originate and in what context are they used? 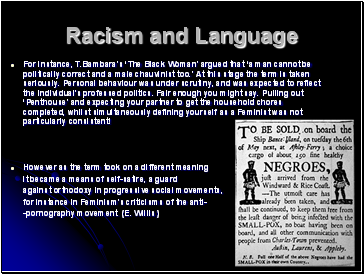 For instance, T.Bambara’s ‘The Black Woman’ argued that ‘a man cannot be politically correct and a male chauvinist too.’ At this stage the term is taken seriously. Personal behaviour was under scrutiny, and was expected to reflect the individual's professed politics. Fair enough you might say. Pulling out ‘Penthouse’ and expecting your partner to get the household chores completed, whilst simultaneously defining yourself as a Feminist was not particularly consistent! 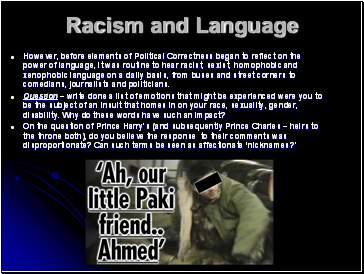 However, before elements of Political Correctness began to reflect on the power of language, it was routine to hear racist, sexist, homophobic and xenophobic language on a daily basis, from buses and street corners to comedians, journalists and politicians. Question – write done a list of emotions that might be experienced were you to be the subject of an insult that homes in on your race, sexuality, gender, disability. Why do these words have such an impact?